Mildred Jeter, a woman of mixed African American and Native American descent, married Richard Loving, a white man, in 1958 in Washington, D.C. They returned to their home state of Virginia to begin their lives as a married couple. Police raided their home and arrested them for violating state law. They were sentenced to one year in prison but the sentence was suspended if they would move out of the state. They did, moving to the District of Columbia. In the early 1960s, frustrated that they could not visit family in Virginia, the Lovings filed a class action suit against Virginia. They lost their case. The Lovings chose to appeal the decision to the United States Supreme Court. The Court made a unanimous decision in 1967 claiming that Virginia’s law was unconstitutional and violated both the Due Process Clause and the Equal Protection Clause of the Fourteenth Amendment. All states that prohibited interracial marriage had to obey the Supreme Court’s decision and begin to allow people of different races to file for marriage. 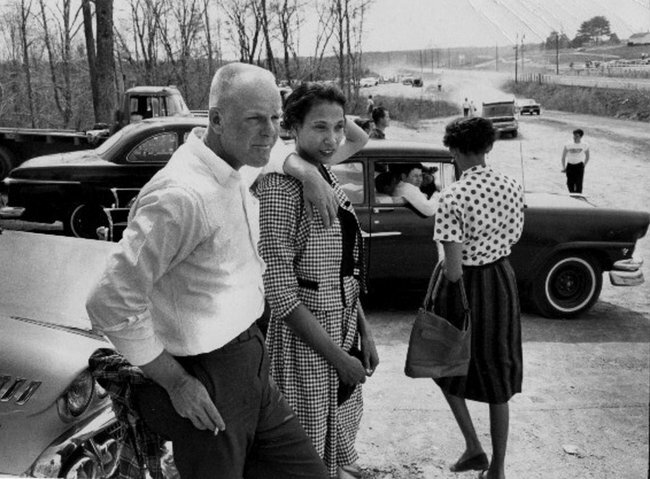 ​In Loving v. Virginia, which is a civil case, the plaintiff or plaintiffs were Mildred and Richard Loving, the party(ies) bringing the lawsuit. A plaintiff is one who claims to have suffered a loss and usually seeks damages, an award of money from the defendant. The defendant is the party being sued. They may argue either that the loss did not occur or that the defendant is not responsible for it. It is the job of the court to provide a place to settle the differences between the plaintiff and the defendant. Lawsuits involving damages of a few thousand dollars or less are often handled in a small claims court, and the people involved may act as their own attorneys. Lawsuits for larger amounts often require lawyers and juries in larger civil courts. The American judicial system deals with many different kinds of civil lawsuits every year. Lawsuits may represent property disputes, breach of contract, or family matters, perhaps like the example above. Many lawsuits deal with negligence, or personal injury. A negligence suit is filed when a person has been injured or killed or when property has been destroyed by someone careless or negligent. A special type of lawsuit is a suit in equity. Equity is a system of rules by which disputes are resolved on the grounds of fairness. In this type of suit, a person or group seeks fair treatment where there is no existing law to help decide the matter. Some people bring suits in equity to prevent a damaging action from occurring. An equity court could require an action to stop a wrong before it happens. One example would be a group of Americans filing a suit in equity to try to prevent their state from building a highway through a local park. A judge, not a jury, usually decided suits in equity. When deciding such a suit, the judge may issue an injunction, which is a court order commanding a person or group to stop doing something. For example, a judge might issue an injunction to stop construction of the highway mentioned above. ​What Happens in a Civil Case? Imagine if you slipped on a neighbor’s icy sidewalk and suffered a broken hip. You feel that the neighbor should have cleaned the sidewalk to keep it safe but didn’t, and this led to your injury. You believe that the neighbor is responsible for your injury and that they should pay for your medical care and other expenses caused by the injury. You decide to sue that neighbor. It is time to start the process by hiring a lawyer, who files a complaint with the proper court. This complaint is a formal statement naming the plaintiff and defendant and describing the nature of the lawsuit. The court sends the defendant a summons, a document telling of the suit against them and ordering an appearance before the court on a specific date and time. The defendant may respond to the charges by having their own attorney file an “answer” to the complaint. This answer will either admit to the charges or offer reasons why the defendant is not responsible for the claims. The complaint and the answer together are referred to as pleadings. Before you go to trial the lawyers on each side have an opportunity to check facts and gather evidence by questioning the other party and possible witnesses. This process is called discovery. The purpose of the discovery phase is for each side to try to avoid any surprises during the trial. The judge assigned to the case might call a pretrial conference with both parties to help clarify differences between the two sides and to prepare for the trial. You and your lawyer might come to the conclusion that your case has little chance of being won and decide to drop the suit. Your neighbor and his lawyer might conclude that you have a strong case and decide to offer you a settlement. This is kind of like the plea bargaining process in criminal cases, but the parties usually agree on an amount of money to be paid to the plaintiff. Another way to resolve disputes is by a process of mediation, in which each side explains its side of the dispute and must listen to the other side. A trained mediator will lead the discussion and act as a neutral party to keep communications flowing. The mediator does not decide the issue, but helps the two sides decide the issue. The two sides may also agree to submit to arbitration. Arbitration is a process conducted by a professional arbitrator acting like a judge by reviewing the case and resolving the dispute. The arbitrator’s decision is usually binding on all parties. ​Either party in a lawsuit may propose a settlement at any time. This might happen during the discovery phase as costs begin to build up and people become more willing to compromise. A lot of civil cases are settled outside of court, before the trial, for several reasons. For one, the outcomes of many trials are hard to predict, and those involved prefer the certainty of a negotiated outcome. Also, most courts have a long backlog of cases waiting to be heard so it could take years before a new case comes to trial. Finally, because trials are time-consuming and expensive, all the major participants (the defendant, the insurer, the plaintiff, the judge, and the attorneys) are likely to prefer a settlement. If the parties do not settle, the case will go to trial. A jury of 6 to 12 members may hear the case or just a judge will hear the case alone. The plaintiff’s side is presented first, followed by the defendant. Both sides will then summarize their cases. In criminal trials the prosecution must prove the defendant guilty “beyond a reasonable doubt.” Civil cases have a lesser standard. The plaintiff in a civil case has to present only a “preponderance of evidence” enough to persuade the judge or jury that the defendant, more likely than not, was responsible for the incident that caused the damages. ​After all the evidence has been presented and the arguments made, the judge or jury will consider the case and decide on a verdict, or decision, in favor of one of the parties. If the plaintiff wins, a remedy is set. In this case, the remedy might be for your neighbor to pay your medical costs, replace your lost earnings, and compensate you for your pain and suffering with a case payment. If the defendant wins, the plaintiff gets nothing and pays the court costs. ​If the losing side feels that the judge made errors during the trial or some other type of injustice happened, they may appeal the verdict to a higher court. In cases in which the plaintiff wins a large cash award, the defendant or the defendant’s insurance company will very often appeal to have the award reduced. As a result, a winning plaintiff may have to wait years before seeing any of the money the court awarded, and may even end up with nothing.